If childhood were a color it would be sparkle. No doubt about it. With this in mind I ventured to try out this recipe to add a bit of childhood to anything. This isn't a new idea at all; it just inspired me to get creative. 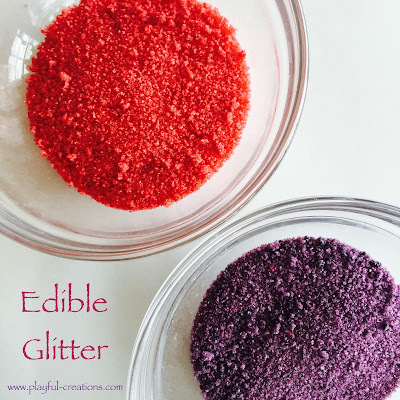 The pictures of this on pinterest show the most dazzling, twinkling glitter that you ever did see (check it out: https://www.pinterest.com/search/pins/?q=edible%20glitter.) Do you see why I would want to try this?! AMAZING! What is actually very exciting about this is that you can do it with sugar or salt! Sweet and savory sparkles for everything! In a container with a lid (I used a mason jar) add 1/4 cup of sugar to 1/2 teaspoon of food coloring. If you are using salt, use 2 Tablespoons of salt to 1/4 teaspoon of food coloring. Close the lid and shake vigorously. Spread out the mixture onto a lined baking sheet. And pop it into the oven for 10 minutes. Studies have shown that having a well stocked cookie cutter collection is essential to the joy and happiness of your children. Seriously! Look it up! I actually use only about 5: a star, heart, gingerbread man, butterfly and Christmas tree. I cut sandwiches, waffles, quesadillas, fruit roll ups, fried eggs, brownies, even chicken and hamburgers. If I could cut brussels sprouts to make them look more fun I would try but I still doubt anyone would eat them! Like anybody we love our chips. Fritos are my personal favorite. I try hard to stay away from basic potato chips with the kids and instead offer up banana chips, pita chips, Pirate Booty, or veggie sticks. My kids have started to eat tortilla chips by the handful when we go out a Mexican restaurant (this basically means Chipotle, not very authentic but tasty!) So I thought to try making my own. The triangle shaped chip is now a thing of the past. Welcome to the tortilla chip 2.0. Lay out all the tortilla shapes on a baking sheet. Spray the tops of the tortillas with the cooking spray. Turn over and coat the other side. Sprinkle your topping on the tops of the tortillas. I used cinnamon sugar on the stars and salt on the hearts. Pop them into your oven for 8-10 minutes. Pull them out and let them cool for a few minutes. Its as easy as that to make your own tortilla chips. Serve them up on their own or with a tasty dip. You can use this recipe during any holiday: Christmas cookies become Christmas tortilla chips; a bat shaped cookie cutter makes for spooky treats at Halloween; Four leaf clovers for good luck on St. Patricks Day, Easter bunnies in Spring, trees for Arbor Day, the possibilities are endless! This is the recipe that keeps on giving!